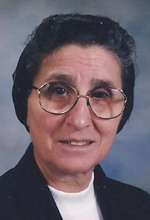 Sister Yolanda Amoroso, M.P.F., died Jan. 28 at St. Joseph Hall, Home Healthcare Center for the Filippini Sisters at Villa Walsh Motherhouse, Morristown, N.J. She was 85. Born and raised in Orange, N.J., she entered the Religious Teachers Filippini in 1948. She received her habit in 1949 and made her religious profession in 1952. Sister Yolanda was awarded a B.S. degree in elementary education from the College of St. Rose, Buffalo, N.Y., a M.S. in reading from the University of Bridgeport and a diploma from the Assumption Montessori School in Philadelphia, which qualified her to be a Montessori teacher. For many years she taught in primary schools in the Archdioceses of Philadelphia, Newark, New York and Hartford, and in the Dioceses of Cleveland, Trenton and Camden. Later in her professional career she received great satisfaction as a Montessori teacher in Winsted and Bristol, Conn. In 2003, retired from active ministry, Sister Yolanda continued to serve in many capacities at Villa Walsh. Among them, she directed art activities and exercise classes for residents at St. Joseph Hall, assisted with driving patients and served as telephone operator. After a severe stroke, Sister Yolanda became a resident at St. Joseph Hall in January 2017 until her passing. Energetic, joy-filled, willing to serve and a faithful member of the Filippini Sisters is the spirit Sister Yolanda leaves behind. The funeral Mass was celebrated Feb. 1 in St. Lucy Chapel at Villa Walsh. Interment was in the Ave Maria Cemetery at Villa Walsh the following day. Sister Yolanda was predeceased by her parents Paul Amoroso and Mary (Romano) Amoroso; brothers Thomas and Alfred, and sister Eleanor McCarthy. She is survived by many devoted, loving nieces and nephews. In lieu of flowers, donations in memory of Sister Yolanda may be sent to St. Joseph Hall, c/o Sister Ascenza Tizzano, MPF, Provincial Superior, Villa Walsh, 455 Western Avenue, Morristown, NJ 07960.